Puglia is the stiletto heal of Italy. The warm climate and flat or gently sloping landscapes and limestone based soils make it ideal for viticulture, wheat, olives and vegetables. 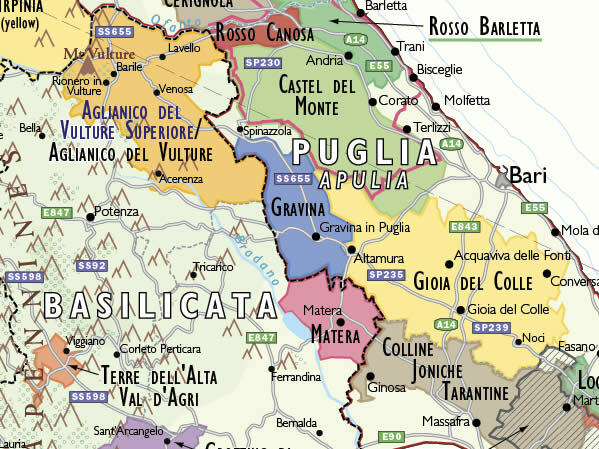 Here are some visual suggestions for pairing Puglian wine and foods. 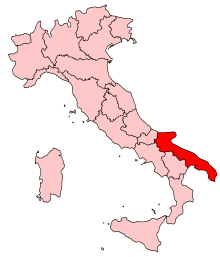 This region produces large volumes of wine running neck and neck with two other regions of Italy , Sicily and Veneto, in terms of volume of production according to Joseph Bastianich in Vino Italiano. In the past most of this wine was undistinguished vino di tavola and probably ended up on you table without ever seeing the inside of a bottle. Much wine was sent away as bulk to other regions of Italy and beyond, either to be blended into local wines or served as house wines in cheap trattoria and restaurants. The most widely planted red wine variety is Negroamaro. See this page for a description of the variety and some food pairing suggestions. Puglian food draws on the local ingredients - the vegetables we associate with Mediterranean lands, seafood, wheat and olives. The cuisine is still very rustic. Simple ingredients are used to make hearty but interesting dishes. For example see this page of three recipes from Sandro at the Fuedi di Guagnano winery. The recipes are based on chick peas, with pasta, soup made with stale bread, and a grill of lamb offal respectively. See the recipes here.